I have no idea why men think women are hard to buy for. Ask a women what she wants and she can produce a long list of shiny things, their preferred colour/size, and where they can be acquired. Ask a fella what he wants, and he'll be considering whether there's anything he needs. (Actually I did ask some boys what they wanted, and one of them said a meat grinder. Which was interesting). Generally speaking, men appreciate design and style, but things should be practical too (this is why they will never, ever get the point of scatter cushions. Ever). So for boys, give them something with a mix of style, function and fun. Whether he admits it or not, every man wants a bar at home. Which is fair enough - there’s something classy about offering guests a tipple when they drop by - or more importantly being able to say, “Darling, let’s get you out of those wet clothes and into a dry martini”! Why not start his fantasy off with something special from the Vodka Emporium - this bottle of Chase Marmalade Vodka is as English as James Bond himself. (£31.77 for a 70cl bottle). Retro cameras are all the rage these days, but while they do look like, totally rad, how practical are they really? Treat the special man in your life to this super stylish digital Pentax H90 camera in orange and grey, just £66 from Pixmania (down from £100) including the case. It has all the cool retro cred of the 80s, with the technical clarity and quality spec of modern-day digital cameras. Every guy deserves a pair of super cool shoes, and in my opinion they don’t get much cooler than this. These Rabbit Brogued Sneakers by Paul Smith are both a trainer and brogue in one - which on paper sounds like it should be hideous, yet look how stylish these are! 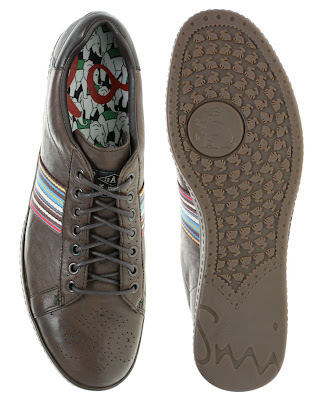 More comfortable than brogues, but dressier than trainers, these are a wear-with-anything shoe, and I love the signature Paul Smith stripes on the side. They were £100 but are now a more happy-making £80, from ASOS. Guest post by Claire Nelson. I really like the shoes. I would like to drink marmalade vodka, with boys who are wearing the shoes. I really like the shoes too. They look like a nicer version of most of the shoes my boyfriend already has (minus the holes). Shame it looks as if they're back to £100 now. Kate: true, but if you use the code NEXTDAY you get free next day delivery at least. Plus ASOS are flinging out 20% off codes like nobody's business at the mo. Well my boyfriend now wants the shoes for Christmas. I guess that's an official boy seal of approval! I think I just have bad timing! May sit tight for a bit to see if they fling another 20% my way :) They would be great for my bloke, need to wean him off the bright red walking shoes...I kid ye not.